This is a very quick and easy recipe; ideal for a last minute one-person meal. Chilli and cheese go together wonderfully here. 1. Beat the eggs lightly in a bowl. 2. Add the finely chopped tomato, onion, chilli, coriander and salt to the eggs, and mix it together with a fork. 3. Heat the oil or clarified butter in a large heavy based frying pan over a medium heat and pour the egg mixture in, turning the pan at the same time so that the mixture spreads evenly over the bottom of the pan. 4. 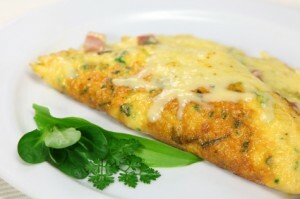 Cook briefly, and flip the omelette over as soon as it is solid enough to be turned. 5. After turning the omelette, sprinkle the cheese over it and turn the heat down to very low. and serve with hot buttered toast. It’s worth knowing that the medical establishment has changed it’s thinking about eggs – they’re not the cholesterol villains that they were once thought to be…..
* Percentage Daily Values are based on a 2000 calorie diet for an average adult. We would love to hear from you about this recipe!